Please see our Lighting category for more choices. Designed specifically for motocross bikes without electric start. The Thumper Jockey MX 1500 kit comes with a compact battery that will power the Light for over two hours. The battery itself has an on/off switch and mounts directly behind the front number plate. The light is made from CNC machined aluminum. The lens is a spot light style glass lens that is virtually unbreakable. 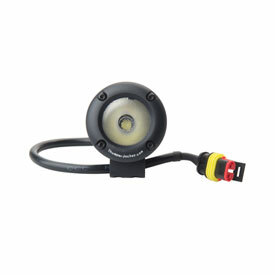 Thumper Jockey used high quality Cree XML LED’s and high performing driver to deliver the brightest possible light. The handlebar mount is strong CNC machined aluminum that clamps firmly to either 7/8" or 1 1/8" bars to keep your lights pointed forward no matter how rough the trails are. For motocross bikes without electric start. is the battery pack a Lithium Ion Battery Pack ? BEST ANSWER: Unfortunately, this item has been discontinued and we are unable to answer this. I'm sorry for the inconvenience. I have a 95 cr250, in a 04 yz250f frame. How dose this lite install? No battery needed? BEST ANSWER: This light is powered by a battery and installs on the handlebars. is this headlight dot legal for street use & is it a rechargeable battery w/charger ? product description does not include this info. want to make a 1992 RM125 d.o.t. street legal, SOUND WEIRD ?WHATEVER GET OVER IT. 60yr old who still wants to ride my retired race bike any time anywhere. BEST ANSWER: It is not DOT approved, but depending on your local laws and regulations it may be acceptable to use on the street in your application. The battery pack is rechargeable and includes a charger for it. BEST ANSWER: This is a 1500 lumen light.